If you walk the halls of the Wheatland Middle School, you will find our halls to be filled with great students and amazing staff. Student work is presented throughout all the rooms and a majority of the hallways and our school is top-notch! This bulletin board is filled with inspirational words that remind our Bulldogs, both students and staff, of why they are here and what they need to accomplish. The first word I would like to point out is right in the middle. ‘Be’ is powerful. We want our kids to just be. Be present in the moment. Be present with your friends. Staff, be engaged in the content. Just be...it is a simple two letter word but powerful. Next, resilient. We are all faced with numerous challenges and problems. We need to show the grit and resiliency needed to conquer these situations. Stick with it and you will be rewarded. Finally, memorable. We want this school year to be memorable for our students and staff. They will have some great times this year at WMS and we want all of our Bulldogs to be enjoying their time here. 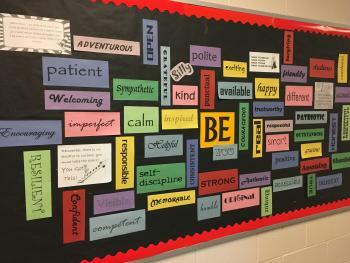 Please feel free to swing by the seventh-grade hallway to review this bulletin board as well as the other great things that are happening in our school. GOOOOOO BULLDOGS!